Want a new access control system that auto-locks, maximizes theft reduction, and lets you restrict entry based on time of day? Then grab hold of this smart keyless lock from Kaba Access. The E3700 lets you give out a card or code that you can quickly delete, and you can do away with that monthly visit to have your locks re-keyed or changed. When you reflect on the inconveniences and lost productivity from chasing down keys, letting people in, and locking left open doors, you can see the urgency for a new key card entry system. You might say it's a necessity for keeping your business on the right path. With Kaba's LearnLok programming, and advanced access control features, the new E-Plex 3700 will adapt and grow with you. You can start small, enrolling your users at the lock, then scale up as needed, managing everything from your computer. The best part is because of the Patented LectroBolt technology, you won't be scrambling around for weeks trying to put it in. You can have it on the door the day it arrives. 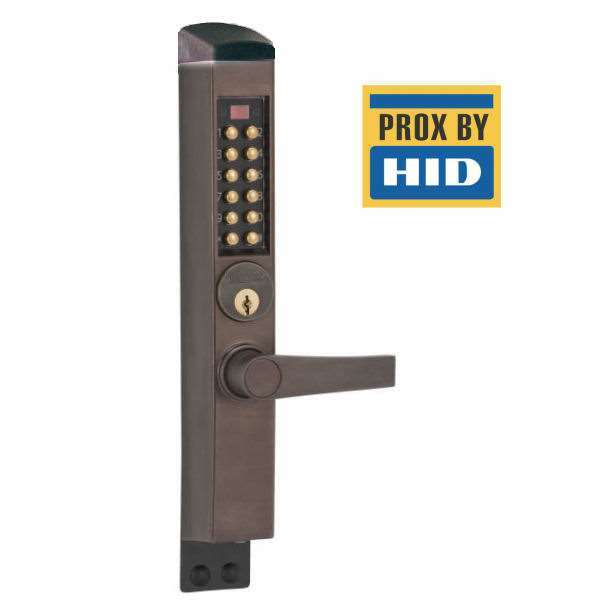 I’m very happy with my new E-Plex 3765 lock, it has many great features. It works really well and looks nice too. I only have two minor issues, I wish the handle were a little bit bigger and the card reader a little more sensitive, you have to get the card in just the right position for it to read it. It was very easy to program and overall I am very happy with my purchase. For panic bar setup with this lock you would need to use the panic bar kit which is a separate item under accessories. As for any other locks it is designed to work with Adams Rite hardware and the 65 version is specifically for the 4510 or 4900 deadlatch.